This is a great time to tour Westsails and renew friendships. The Marina Inn overlooks the marina and offers special rates for our event. Call 800 786 7783 for reservations - ask for the Westsail Rendezvous rate. Saturday, boat tours and visiting followed by a delicious dinner, special guest speaker SLYC Commodore Norm Pennington will present on VHF DSC radio with GPS capabilities. Saturday 3:00 pm Ethan Hirschfeld of Beta Marine Sausalito will be talking about diesel engine maintenance and Beta engines. Our famous red raffle finishes the evening. New for 2012 is the Westsail SF Bay Cruise to follow the weekend rendezvous. The current plan is to sail the bay stopping at various anchorages and moorings. Whether you can cruise the whole week or not try to meet up by Friday night to anchor in Aquatic Cove. Free Permit Required so send in your permit early. Saturday from the cove you will have a bird's eye view of Fleet Week Blue Angles performance. 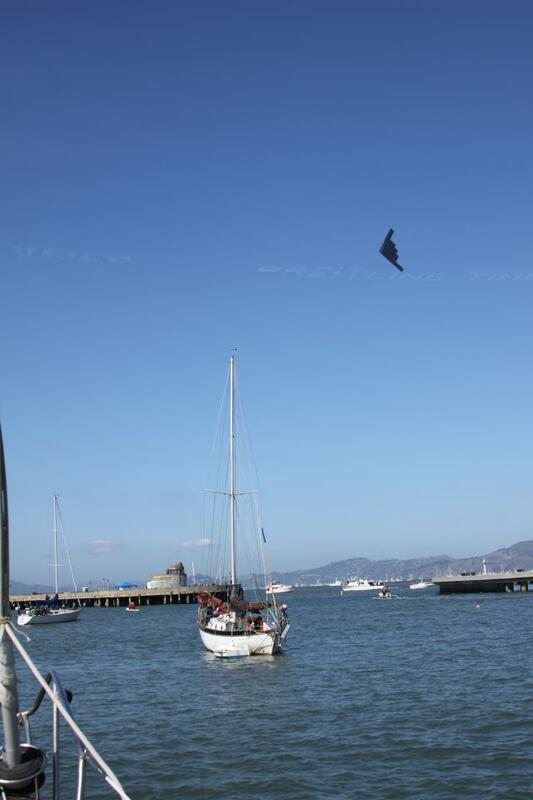 Tortuga W32 and a B-2 over head - Image by Julie Focha.